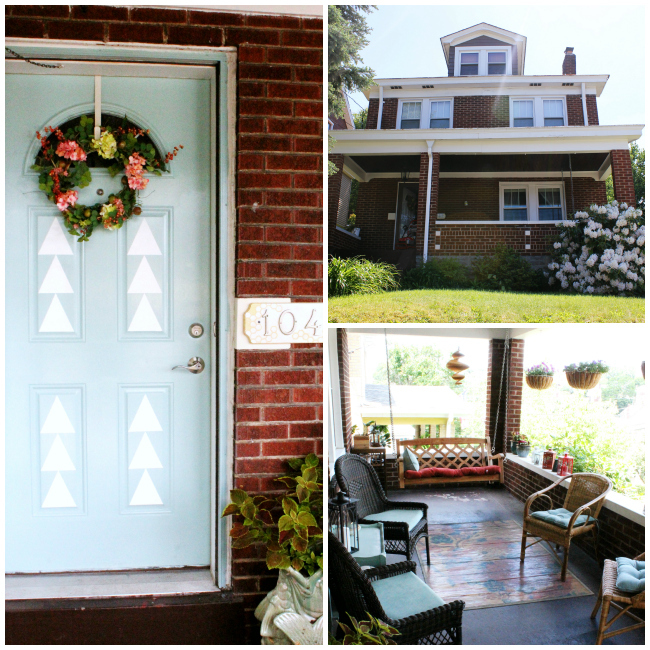 My boring white front door has been killing me since we moved in almost 4 years ago. Seriously, every time I looked at it I felt as if a small part of my life was being sucked away by the boringness. I've been mulling over ideas for over a year now and could never settle on anything. Finally, the other day, during an impromptu visit to our local small hardware store, I said screw it, and bought some paint. This is what resulted... and quite honestly... I LOVE how it looks! It's amazing what some bright colored paint and tape can do to cut through boredom. The next big project is the porch floor itself... There are precisely 4 layers of AWFUL colored paint that date all the way back to the early 1900s (yes, seriously). We've attempted powerwashing... epic failure. I prefer the naked concrete below, but my husband wants to just repaint. Anyone have any tips or ideas for what to do with an ugly painted concrete porch? We spend a lot of time out here and I want to make it beautiful! The brown is just so drab and dirty. Thanks for stopping by my sweet little home today! 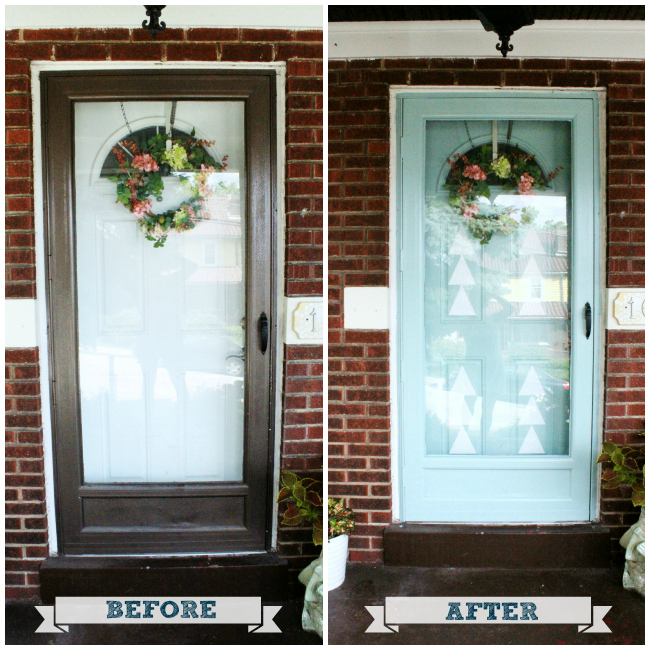 Your door looks seriously awesome!! No other ideas about the porch but maybe paint it a brighter colour and add a rug?! The door color looks great! Love that it picks up the color of your seat cushions! fun seats and tables but painting it a bright color might be an option. Good Luck! That door is very different but in a good way. I would love to try something like this but my door is frosted glass. 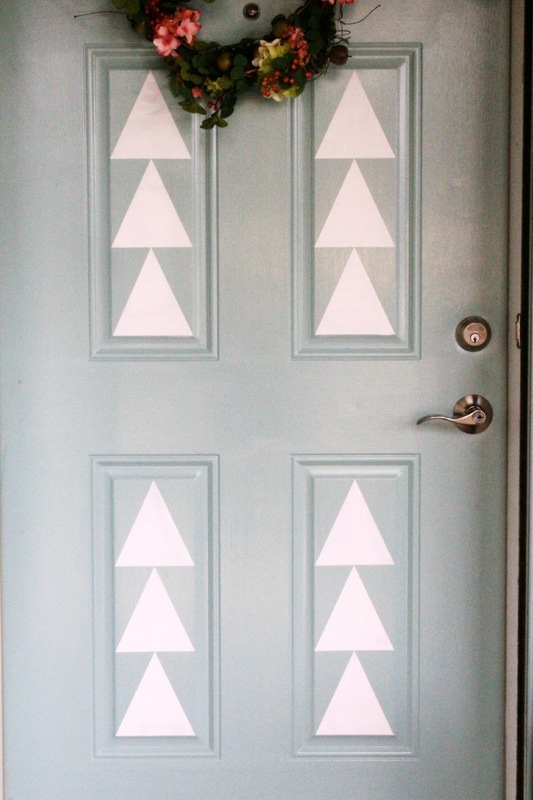 The triangle details make this door so unique! Love it! ~M. i'm loving the arrows and that you painted the surround! my home needs some oomph to it, but it's too stinking hot out to tackle anything outside. How lovely! The color is gorgeous! It turned out great! It's much more fun now. I'm a new follower on bloglovin. How fun! I love the new color on your door. The arrows were a great idea. Hello! I came over fom Serenity Now and love your makeover. I made over my door last year after 5 years of staring at the ugliest door ever! We need to tackle the porch too, there's at least 2 layers of paint and it desperately needs a facelift! Good luck removing the paint. 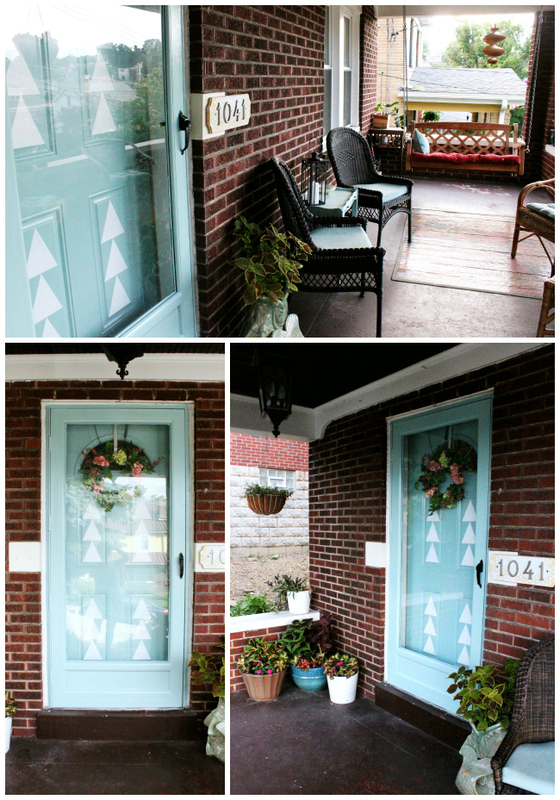 Love how your frond door make-over turned out! What a creative idea.